BREWERIES 192 • SHOPPING CENTER BUSINESS • May 2018 W hen Freddy Bensch and Kevin McNerney arrived in Atlanta two decades ago, their goal was to bring a West Coast-style brewery to the Southeast. In 1997, the pair opened Sweetwater Brewing Co. in a nearly aban- doned industrial park located off Fulton Industrial Boulevard in Atlanta. More than a decade later, the area still houses industrial tenants but has been transformed through adaptive mixed-use projects like Armour Yards. Atlanta-based developer Third & Urban first unveiled plans for the project in 2015 and has since converted a pocket of intown industrial buildings into a community of creative of- fice buildings and chef-driven restaurants — all located steps away from Sweetwater Brewery. Located near Interstate 85, the area is known as the Sweetwater Design District. Sweetwater Brewing Co., now Atlanta's largest craft brewery, is the centerpiece of that district and the catalyst behind the neighborhood's revitalization. 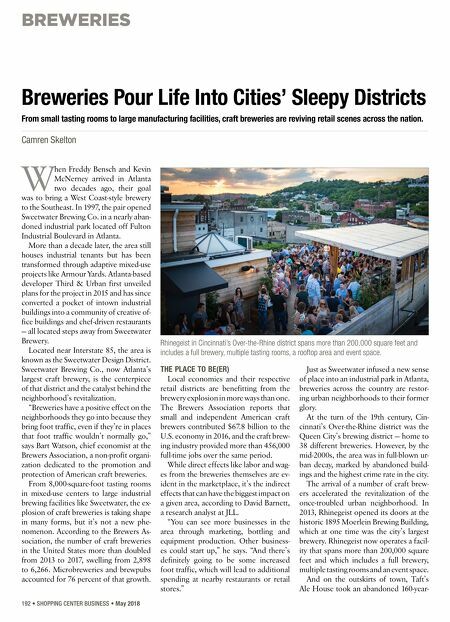 "Breweries have a positive effect on the neighborhoods they go into because they bring foot traffic, even if they're in places that foot traffic wouldn't normally go," says Bart Watson, chief economist at the Brewers Association, a non-profit organi- zation dedicated to the promotion and protection of American craft breweries. From 8,000-square-foot tasting rooms in mixed-use centers to large industrial brewing facilities like Sweetwater, the ex- plosion of craft breweries is taking shape in many forms, but it's not a new phe- nomenon. According to the Brewers As- sociation, the number of craft breweries in the United States more than doubled from 2013 to 2017, swelling from 2,898 to 6,266. Microbreweries and brewpubs accounted for 76 percent of that growth. THE PLACE TO BE(ER) Local economies and their respective retail districts are benefitting from the brewery explosion in more ways than one. The Brewers Association reports that small and independent American craft brewers contributed $67.8 billion to the U.S. economy in 2016, and the craft brew- ing industry provided more than 456,000 full-time jobs over the same period. While direct effects like labor and wag- es from the breweries themselves are ev- ident in the marketplace, it's the indirect effects that can have the biggest impact on a given area, according to David Barnett, a research analyst at JLL. "You can see more businesses in the area through marketing, bottling and equipment production. Other business- es could start up," he says. 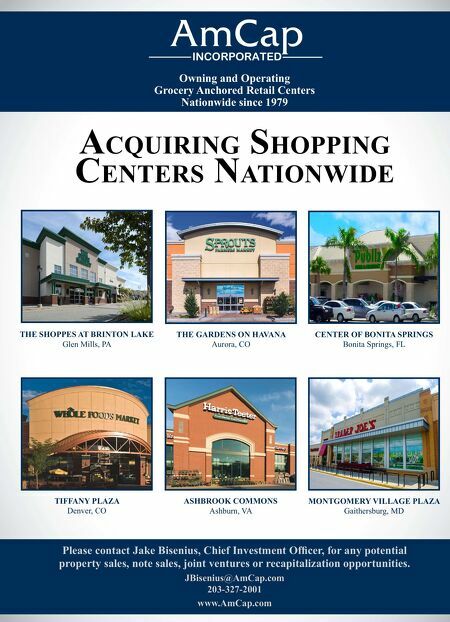 "And there's definitely going to be some increased foot traffic, which will lead to additional spending at nearby restaurants or retail stores." Just as Sweetwater infused a new sense of place into an industrial park in Atlanta, breweries across the country are restor- ing urban neighborhoods to their former glory. At the turn of the 19th century, Cin- cinnati's Over-the-Rhine district was the Queen City's brewing district — home to 38 different breweries. However, by the mid-2000s, the area was in full-blown ur- ban decay, marked by abandoned build- ings and the highest crime rate in the city. The arrival of a number of craft brew- ers accelerated the revitalization of the once-troubled urban neighborhood. In 2013, Rhinegeist opened its doors at the historic 1895 Moerlein Brewing Building, which at one time was the city's largest brewery. Rhinegeist now operates a facil- ity that spans more than 200,000 square feet and which includes a full brewery, multiple tasting rooms and an event space. And on the outskirts of town, Taft's Ale House took an abandoned 160-year- Breweries Pour Life Into Cities' Sleepy Districts From small tasting rooms to large manufacturing facilities, craft breweries are reviving retail scenes across the nation. Camren Skelton Rhinegeist in Cincinnati's Over-the-Rhine district spans more than 200,000 square feet and includes a full brewery, multiple tasting rooms, a rooftop area and event space.